The Pinchart family from Casco believes in FFA. 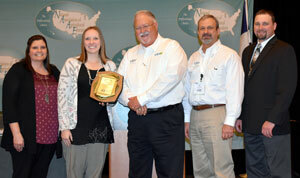 They are living examples of the organization's mission to grow leaders in the agricultural industry. 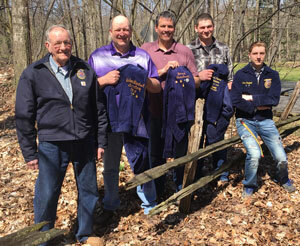 Three generations of Pinchart's have received the Wisconsin State FFA Degree — Gary Pinchart, sons Brian and Brad, and Brian's sons Nicholas and Samuel. "I believe in the future of agriculture, with a faith born not of words but of deeds – achievements won by the present and past generations of agriculturists; in the promise of better days through better ways, even as the better things we now enjoy have come to us from the struggles of former years." Wrightstown ag teacher and FFA advisor Brian Pinchart shares the message from the FFA Creed above, and says: "Growing up on a family farm, the first paragraph of the FFA Creed has a special place in my heart. My great-grandfather John taught me how to drive tractor on an old Ford 9N before I could read. Both my grandfathers worked on the family farm, providing years of insight. My dad taught me the importance of learning and the willingness to try new thing. My hope is that I past these traits on to my children as they pursue their own agricultural endeavors." This holiday season, give the gift that multiplies! Visit wisconsinffafoundation.org/donate to make a gift. 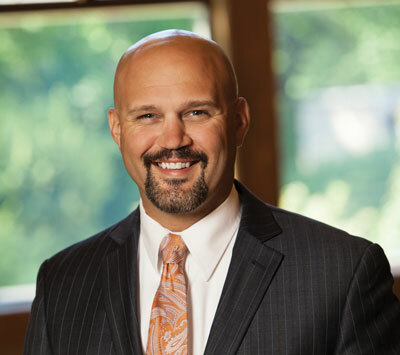 The Wisconsin FFA Foundation Board of Directors is excited to welcome Trever Athorp, Vice President - Ag & Business Banking Officer at Investors Community Bank, as a board director. Trever has been employed with Investors Community Bank since 2003. He began his time there as a commercial lender and transitioned to the ag department in 2014. In his current role, he works with existing ag producers and agribusinesses as well as prospective customers to provide funding and cash management services. Trever was raised on a dairy farm near Sheboygan, which is still owned and operated by two of his brothers. He was an active FFA member throughout high school, serving as an officer three out of four years. In addition to working on the home farm throughout his youth, a meaningful ag experience for Trever was showing steers at the Sheboygan County Fair. Trever lives in Howards Grove with his wife, Courtney, and children, Mary and John. Early registration deadline is January 7th! Interested in supporting Wisconsin FFA members as they pursue their higher education goals? The Wisconsin FFA Foundation is accepting new scholarship sponsorships through March 15, 2019. 35 chapters were awarded a total of $31,017 in scholarships from the Foundation. 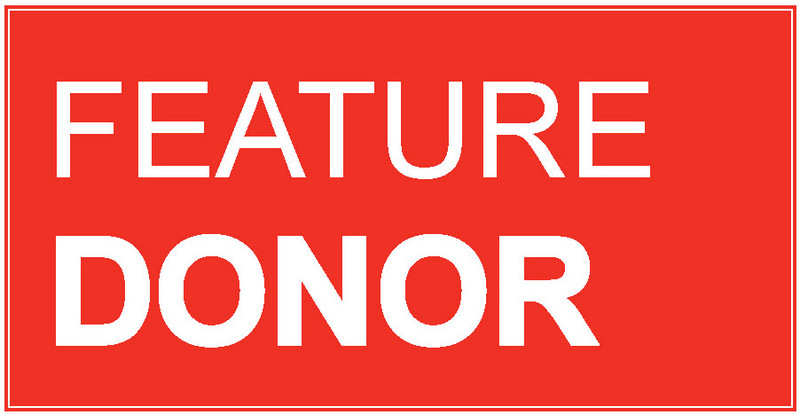 Scholarship sponsorships ($625 minimum) can be named in memory or honor of an individual, and be directed to support a specific major, local chapter or geographical area. The Foundation scholarship program is open to FFA members in good standing, who are at least a senior in high school, or already enrolled in college, and have maintained a satisfactory scholastic record in school. Donors are involved in the scholarship selection process and recognized through press releases, online and social media avenues, as well as the FFA Annual Report. For more information on sponsoring a Wisconsin FFA Foundation Scholarship in 2019, contact John Hromyak via email at jhromyak@wisconsinffafoundation.org or by calling the Foundation office at (608) 831-5058 x3. 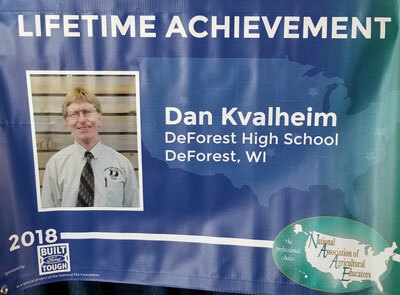 Dan Kvalheim of DeForest was one of only six individuals nationwide who was selected for the 2018 National Association of Agricultural Educators (NAAE) Lifetime Achievement Award. Jamie Propson, agricultural educator at Mishicot High School, was one of only six individuals nationwide who received the NAAE Teacher Mentor Award. 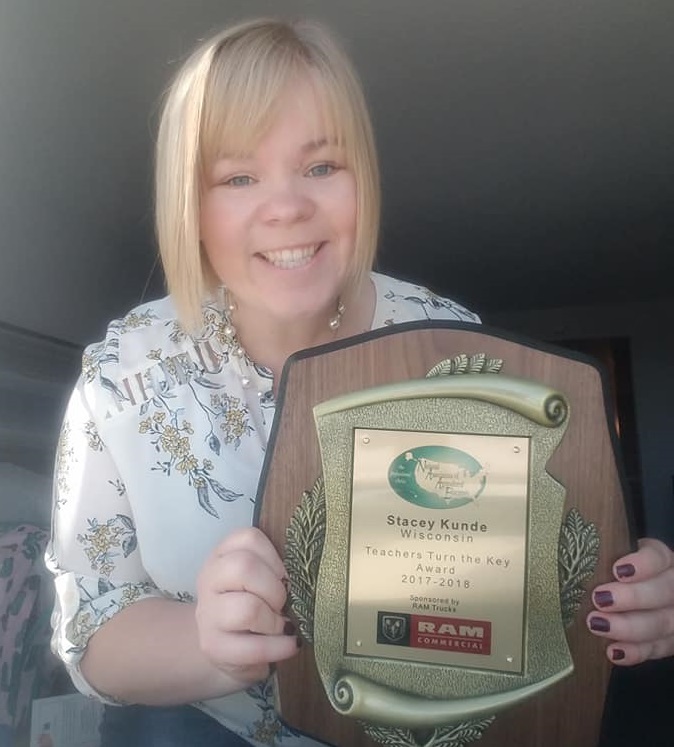 Stacey Kunde, agricultural educator at Brillion High School, was one of a select group of agriculture teachers nationwide who received the 2018 Teachers Turn the Key professional development scholarship from NAAE. The 2018-19 State Officer Team has been busy conducting chapter visits around the state. During these events, officers visit local FFA chapters in their section and provide leadership training and group activities to encourage FFA involvement. Thank you to the Wisconsin FFA Foundation's Leadership Partners & Leaders' Legacy donors, who support these types of activities. With more than 20,000 FFA members statewide, these on-site, personal visits enable our state officers to reach many members directly. 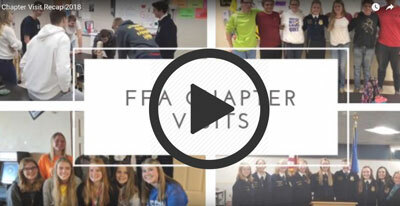 Click the image below to see the state officer team's 2018 chapter visit recap video. Chippewa Valley Bean’s passion for supporting FFA runs deep. The founder of the company, Russell Doane, is proud to have served as a 1948-1949 State FFA Officer. A lifelong farmer, Russell experimented in various crops before finally finding his niche in dark red kidney beans in 1968. 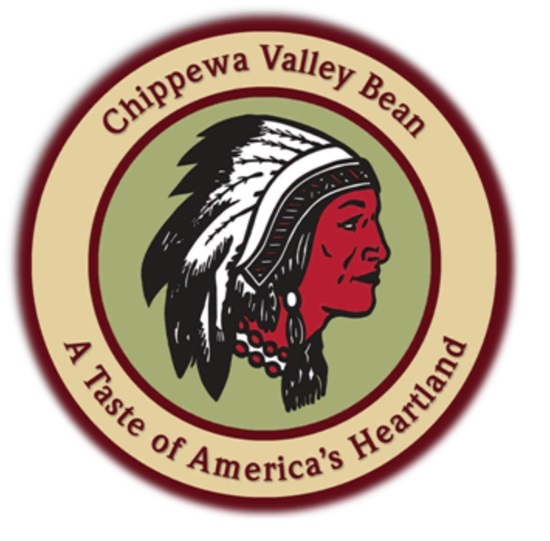 Today, Chippewa Valley Bean/Doane Ltd. is still a family-owned farm and the world’s largest processor of dark red kidney beans. The 7th and 8th generations of the Doane Family currently farm the original homestead established in 1858, located in rural Menomonie. Along with their acreage, they work with over 100 family farms throughout the Midwest to offer premium quality dark red, light red, white kidney beans, and organic dark red kidney beans to customers all around the world. Chippewa Valley Bean is a proud sponsor of the Wisconsin FFA Specialty Crop Production Proficiency Award. Donate items for this two-day silent auction sponsored by The Country Today at the Eau Claire Farm Show. All proceeds benefit the Wisconsin FFA Foundation. For more information, or to donate an auction item, contact Heidi Clausen at heidi.clausen@ecpc.com. Donate items for the three-day silent auction held in Hangar B at the WPS Farm Show. All proceeds benefit the Wisconsin FFA Foundation. For more information, or to donate an auction item, contact Jen Bradley at jbradley@wisconsinffafoundation.org, or use this link for a donation form.